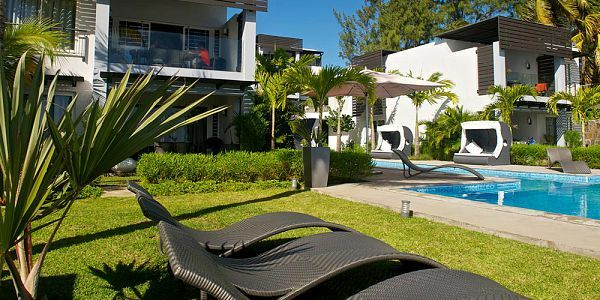 Plage Bleue Apartments is your ideal apartment beachfront accommodation at the North Coast of Mauritius. If you are searching for a blissful, relaxing and comfortable holiday with an array of things to do near Grand Bay, Plage Bleue Apartments offers it all. 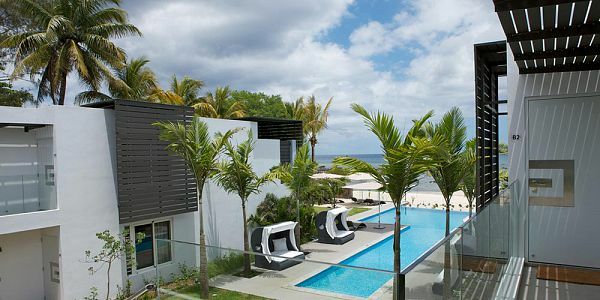 This luxury beachfront apartment complex consists of twelve three-bedroom units and two private duplexes each with a private pool. All guests of Plage Bleue are sure to enjoy great view over the ocean and access to the beautiful Trou Aux Biches beach. Plage Bleue truly combines the freedom of luxury beachfront accommodation with a range of ser-vices expected from a discerning clientele. 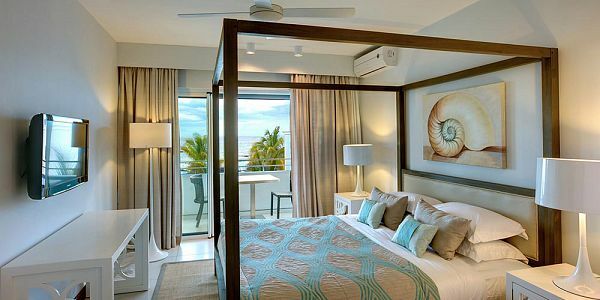 Clients may choose to be left entirely alone to discover their newfound paradise or opt for the personal attention available at the Plage Bleue complex to make the most of their time in Mauritius. 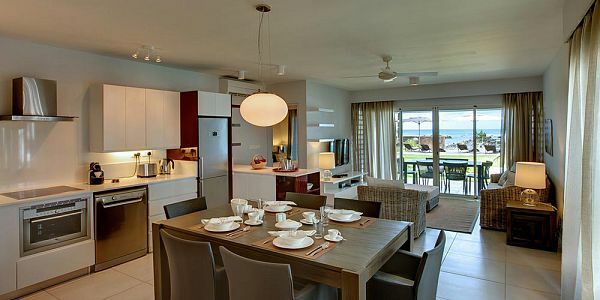 In addition, Plage Bleue it is ideally situated at Trou Aux Biches, 15 minutes from Grand Bay, offering quick access for all those wanting to spend their holiday in close proximity to the bustling Grand Bay, the best place for night out, dining and for many of Mauritius leisure activities. It is also a perfect place to enjoy a peaceful and dynamic journey surrounded by a magical nature. 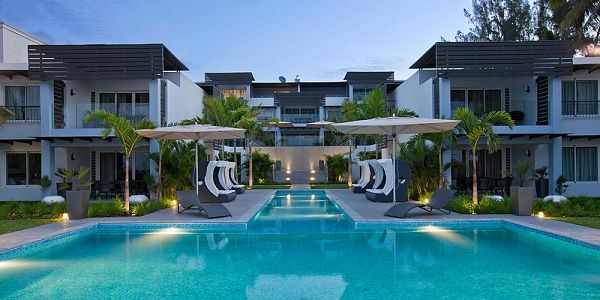 Plage Bleue Apartments is the best place to relax after the routine and tiring life with the comfort and tropical chic decor of all apartments, the beautiful beach and the romantic sunsets over the lagoon in the evening. A perfect location for those wanting to be in the North: only 15min from Grand Baie. Beautiful sundowners over the lagoon in the evening. 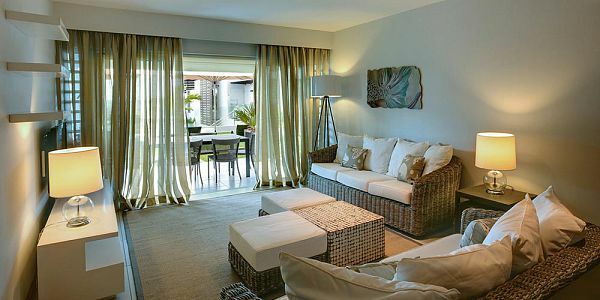 The comfort and tropical chic decor of all apartments. The calm of the area. Proximity of restaurants and shops nearby. Verandah Pointe aux Bîches Hotel within walking distance. 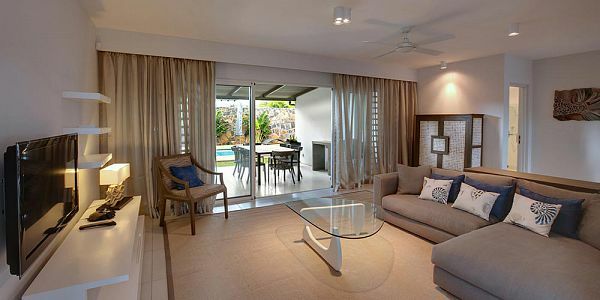 Plage Bleue Apartments are located at Trou aux Biches at the North of Mauritius. Trou-aux-Biches is one of the most beautiful village of the Island, surrounded by luxuriant vegetation, white sand beaches and crystal clear water. 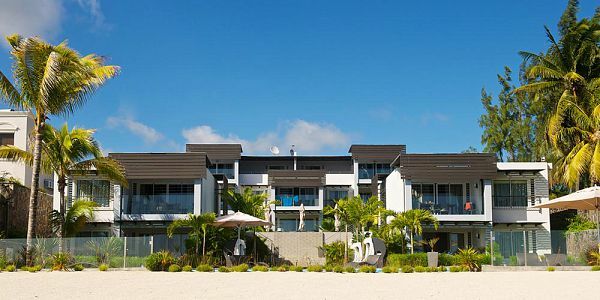 This gorgeous Heaven has something for everyone: peaceful walks at sundowner and relaxing days on the beach. Despite the modern developments, Trou-aux-Biches keeps its local beauty and atmosphere. 1hr 05 drive to the airport, however, this depends on traffic and peak-hour. It is wise to leave at least 4 hours before departure time of flight. 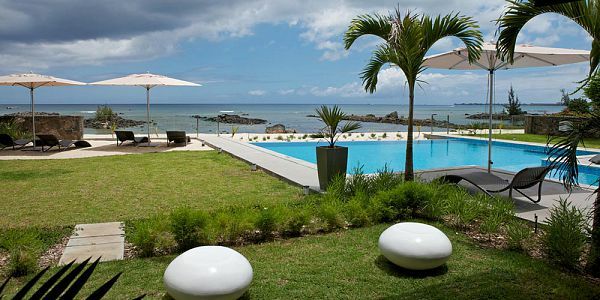 Complex facilities at Plage Bleue include a beautiful infinity swimming pool surrounded by sun loungers and beach umbrellas. The friendly presence of our on-site manager ensures guests a stress free stay, so that you may focus on your holiday without restrictions, timetables or dress-codes. 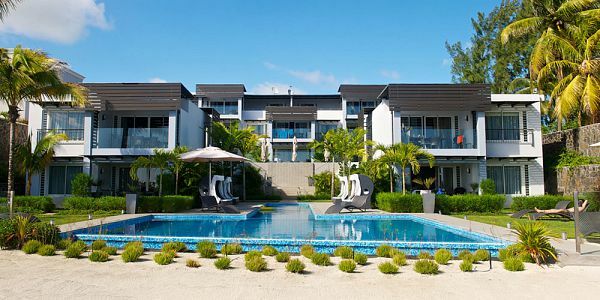 The Premium Apartments are located behind the pool area, with direct views on the pool, garden and beach, the premium apartments provide the perfect respite from a perfect day under the tropical sun. The ground floor units which is in fact on the first floor enable guests to get down some stairs to get to the pool and beach area, while the first and second level units enjoy a flawless view of the Horizon. 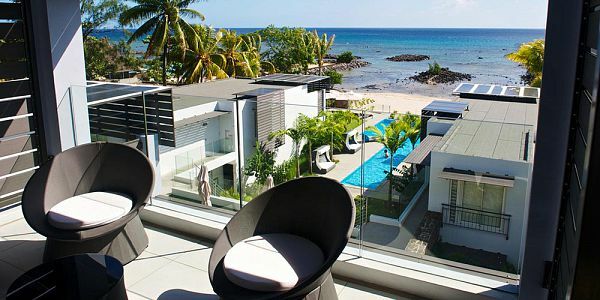 Modern touches such as glass bordered balconies, 40 inch flat screen televisions, Nespresso ma-chines and sleek architectural lines make the Plage Bleue beachfront Apartments a premier choice of accommodation on the North West Coast for the discerning traveller. The Premium apartments offer increased affordability without compromising on quality or service. 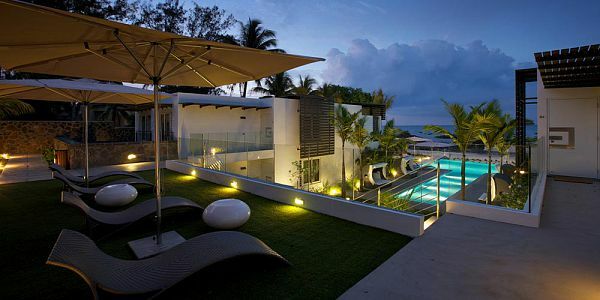 They are identical to the beachfront units. Large glass openings revealing breathtaking views of the lagoons, and tranquil sound of the ocean crashing on the reef is the background music to the ears. These are the words that best describe the magical experience of the Beachfront Apartments. 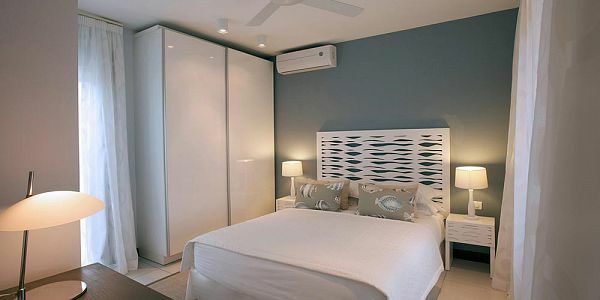 The Beachfront Apartments are situated closest to the beach, two beachfront apartments are located on the ground floor and two on the first floor. The ground floor units enable guests to walk straight out towards the pool area, while the first level units enjoy an unobstructed view of the horizon. The Plage Bleue Superiors apartments offers the largest living areas and spacious outdoor terraces of the of the Plage Bleue complex. Each apartment consists of three en-suite bedrooms, making them the ideal fit for a five-star clientele in search of priceless views. 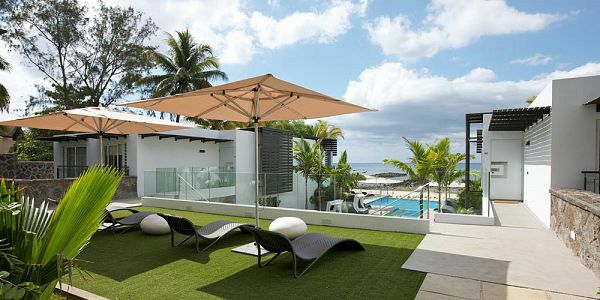 The terrace consists of an elegant outdoor lounge suite and a eight seater outdoor dining table. Wraparound glass balcony panes contribute a modern touch to the chic interiors and are safe for children. Clients will enjoy panoramic views from any area of the property. 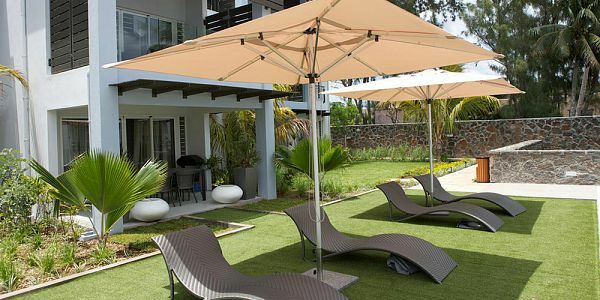 The Plage Bleue Duplexes are located right behind the Premium Apartments and comprise 2 identical three bedroom properties on two levels within a private garden and pool area. 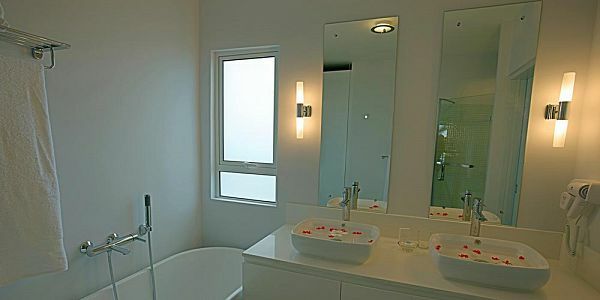 Guests enter the duplexes though their own private entrance, and enjoy increased privacy. The duplexes themselves are built on two levels and offer superior spaciousness. From the parking area, guests enter the living and dining area which flows seamlessly into the kitchen and master bedroom. A large sliding door opens onto a spacious and airy outdoor terrace which may also be accessed via the bedroom located on this level. Pool Area at the front of the complex with large pool. 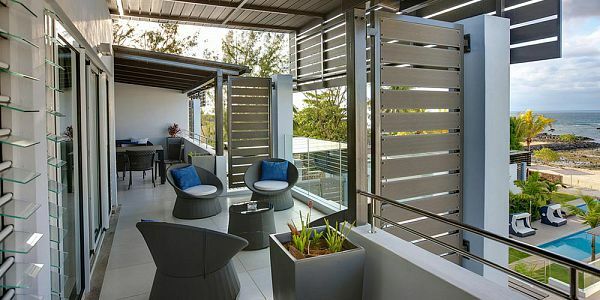 All balconies are furnished with outdoor furniture and glass panes. A gas extinguisher is supplied in each apartment and in the Superior apartment, we have an outdoor living and dining area. King Size Bed in Master Bedroom, Queen Size in Bedroom 2 and Twin single beds in Bedroom 3. 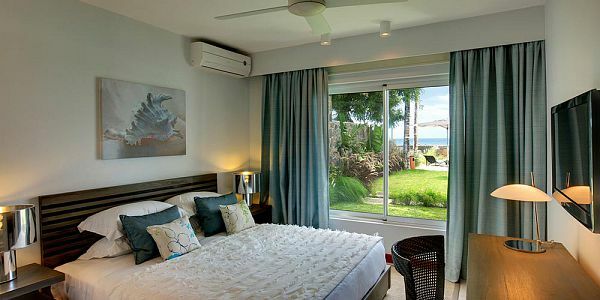 Master Bedrooms communicate to balcony and to lounge area. Mini safe in Master Bedrooms. Open Plan kitchen with high quality standards. Full set of cutlery and crockery to match maximum occupancy. Nespresso Coffee Machine (coffee provided) with 10 capsules. Full range of kitchen utensils and BBQ utensils. Full range of plastic cutlery for children. 4 seater couch and low table (6 seater for Superior apartment). 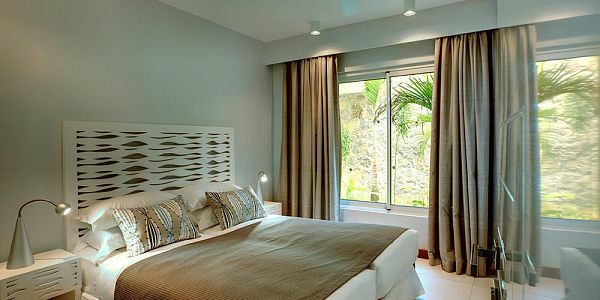 Quality linen provided and changed 3 times weekly:High thread-count quality cotton (white) bed-sheets, towels, beach/pool towels, duvet, duvet covers, pillows, pillow protector cases (without border) and pillow cases also provided. Pre-stocking of groceries available on request (Please send the list max. 5 nights prior ar-rival). Some of these restaurants will be able to deliver your meal at your apartment. Our complex manager can easily organise a chef in your apartment : Rs. 700 for the travel expense + the cost of groceries per meal + the cost of menu. Breakfasts may be offered at a supplement of € 8 Euro per person per day (Pastries, tea, coffee, milk, yogurt, fruits, bread, butter, jam and fruit juice).